Wedding toasts can be such a wonderful part of your wedding reception. And they can be a disaster in the hands of an unprepared toaster. 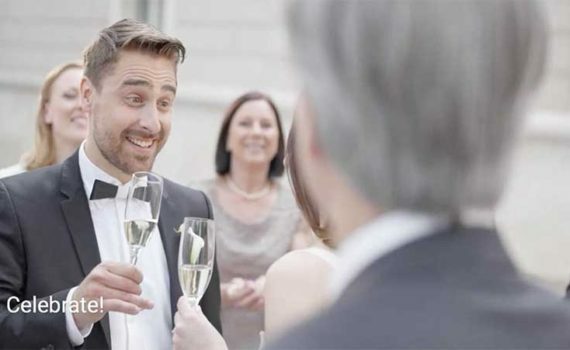 Here are some really excellent … and PRACTICAL … wedding toast delivery tips presented in the video below. Tip #1: KNOW your toast. Know it well enough so you don’t need it scripted. It’s okay to have a few bullet points on a note card. But if you’re able to tell a nice, warm story about the bride or groom, you’ll find it really easy to remember and convey your toast. Tip #2: Make EYE CONTACT. A simple technique to get started is to stand up straight and tall, smile like you’ve never smiled before, and cast your gaze across the room. What expectation you’ll create! You’ll have the audience in the palm of your hand before you even begin talking. As your toast unfolds, cast your gaze around the room, working every corner of the hall. Are you shy? Are you scared to death at making eye contact? No problem. Before you begin your toast, identify a few people you’re close to in different areas of the venue, and you can focus your gaze on them. What can be really helpful to you is to make a point to introduce yourself to as many people as you can at the reception before the toasting begins. That way, there are fewer strangers in the hall! And let me tell you, if you look at someone and smile, it is really, really hard for them to do anything other than smile back. Toasting is so rewarding when it begins and ends with a smile. Tip #4: Be CONVERSATIONAL. The conversational approach is intimate and compelling, IF you have properly rehearsed your toast. The worst thing you can do is to have a few too many drinks and let your ‘conversational’ toast drag on and on. (Actually, worse than that is to embarrass the bride and group. But you know better than to do that!) Limit your alcohol. Rehearse. Make eye contact. You’re going to be great! When it comes to your reception, Crestline Entertainment provides that impeccable timing that only professional MCs bring to the table. We know how to time the toasts, the cake cutting, and all the key moments of your reception. Get ready for the best day of your life!